With great sadness we announce the passing of Carman on September 29, 2018 at Extendicare Port Stanley. A resident of St. Thomas for over 60 years, Carman was born at Lion’s Head, ON on May 10, 1931. Devoted husband of Eileen (nee Curle); loving father of Mitchell (Bev), the late Deborah (John White), & Phillip (Tabitha). Fondly remembered by eight grandchildren, and several great grandchildren. Son of the late Peter & Esther (Heath) Greig. Predeceased by all of his siblings: baby Emilyn, Bessie Blacklock, Mabel Mielhausen, Mary Stewart, Helen King, Wilfred, Ken, Winston "Wink", Cecil, William "John", & Stanley. Carman operated his own business, Greig Maintenance Service, until he retired. 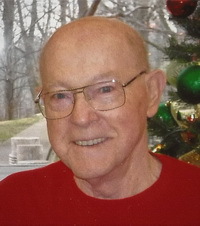 He was a past active member of The Odd Fellows Lodge for 42 years. He worked tirelessly in the St. Thomas community, always a willing hand. In his early career he worked on the ships in the Great Lakes and that turned into a passionate interest through his life. Carman will be missed by many, but we won't forget his focus on family, the community and his ever present sense of humour and giving nature. A service to celebrate Carman’s life will be conducted from the Thomas C. Whitcroft Peninsula Chapel, 272 Berford St., Wiarton (519) 534-5341 on Saturday October 20, 2018 at 1 o’clock. Cremation had taken place. Donations to the charity of your choice would be appreciated.